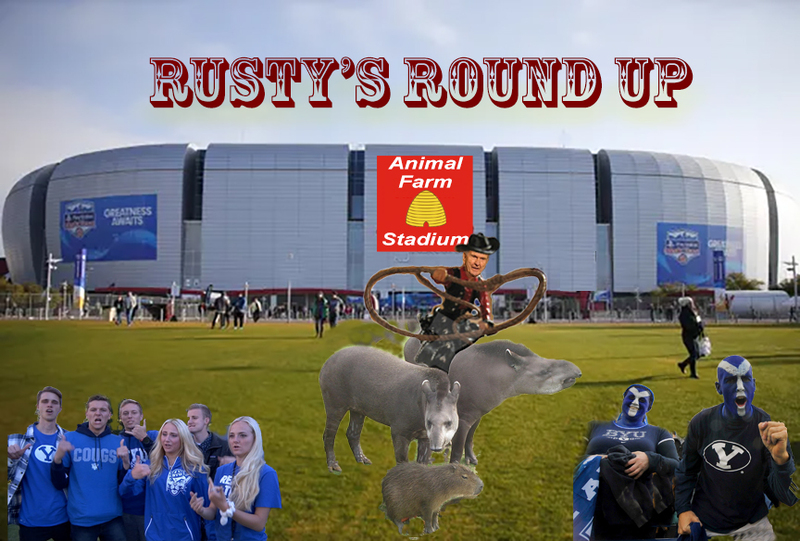 Get your tapir on, oops, I mean get on your tapir and go support that boring old rodeo of Rusty and the gang Sunday in Glendale, AZ. Darn it, I had hoped you had given a link to an ex-mo gathering in Arizona. I am thinking of moving there and hoping to find there is a group there I could meet. But your link was very funny anyway. More like urges mimicking the LDSC. I like the tapirs but WTF is a capybara doing in the pic ? The capybara makes it funnier! Animal Farm! Hilarious slamtoon! Thanks, Cricket? Cumoms can be useful, but only when they stand on all four legs. Four legs good. Two legs baaaad! Or is it the other way around? Speaking of cumoms, I can't wait to get over to the steak center next weekend, when they have that cumom prime rib special buffet and curelom racing in the courtyard. Speaking of curelom meat, if you carefully salt the curelom meat..
will it be cured curelom? Speaking of cured hams, why don't they ever tell you what disease the ham had before it was cured? Corrected: (This is what I get for not loggin in and being able to edit).